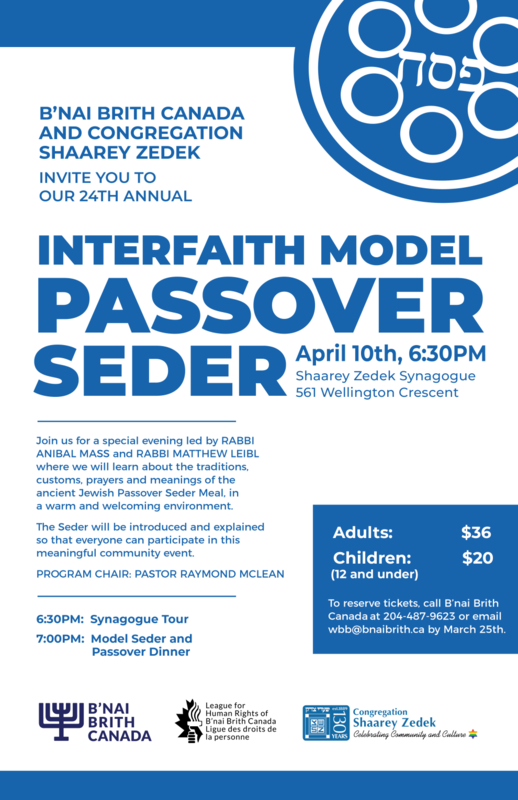 Join us for a special evening celebrating community and tradition at the 24th annual Interfaith Model Passover Seder, organized by B’nai Brith Canada and Congregation Shaarey Zedek. When: April 10th , 2019 starting at 6:30 p.m.
Where: 561 Wellington Crescent, Winnipeg, MB. Attendees will enjoy a wonderful meal and recite passages and songs from the Haggadah as we take part in the traditional Passover Seder, which will be led by Rabbi Anibal Mass and Rabbi Matthew Leibl. Please R.S.V.P. by March 25 by contacting us at 204-487-9623 or at wbb@bnaibrith.ca.